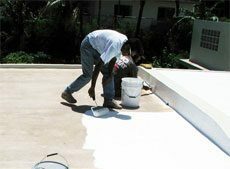 PUMA XL is the latest product provide by Commercial Roofing of Tulsa, OK, an advanced technology, premium roof coating. Conklin has combined the best performance of urethane and acrylic polymers to create this seamless membrane. It has excellent adhesion to many different Tulsa Commercial Roof styles. When compared to industry standards and competition throughout Tulsa, PUMA XL delivers exceptional tensile strength and excellent elongation. this makes it tougher and more durable than conventional acrylic roof coatings. This product carries an unprecedented 18-year warranty. With PUMA XL you will experience long term protection and seamless membrane for superior waterproofing. You will also see low VOC emissions and lower energy costs due to the cool, reflective top coat. Tulsa Commercial Business Owners and Property Managers love PUMA XL on their buildings roofs because of the years of protection and significant energy savings. And from an installation stand point, it requires less drying time than other coatings, between 2-6 hours. If you have more questions regarding this revolutionary roof coating system, feel free to call out office at (918) 992-2020 or fill out the simple contact form found on this page. We look forward to hearing from you. Drop us a line, and we can answer any questions you may have. We can also provide you with a Free Commercial Roofing Estimate.